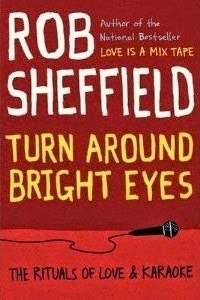 Turn Around Bright Eyes picks up Sheffield’s story right after Love Is a Mix Tape. He is a young widower devastated by grief, trying to build a new life in a new town after his wife’s death. As a writer for Rolling Stone, he naturally takes solace in music. But that’s when he discovers the sublime ridiculousness of karaoke, and despite the fact that he can’t carry a tune, he begins to find his voice. His karaoke obsession takes him to some strange places, whether that means singing a Frank Sinatra song in a senior-citizen community in Florida, attempting a Merle Haggard classic at a cowboy saloon in the Mojave desert, or clearing the room at an after-hours dive in Chinatown. But he finds the music leads him to the most surprising place of all–a new life and a new love. Turn Around Bright Eyes is a story about finding the courage to start over, move on, and rock the mike. It’s about falling in love and navigating your way through adult romance. It’s about how you can learn the weirdest things about yourself just by butchering a Hall & Oates song at 2 A.M. under fluorescent lights in a room full of strangers. It’s about how songs get tangled up in our deepest emotions, evoking memories of the past while inspiring hope for the future. But most of all, it’s a book about all the strange ways music brings people together. Sweet, funny, honest, and full of the music you love, hate and love to hate, Turn Around Bright Eyes is Rob Sheffield at his very best. After jumping back to Sheffield’s teenage years with Talking to Girls About Duran Duran he comes back to his adult life. Love is a Mix Tape was a rip-your-heart-out-and-ugly-cry memoir about how he met his first wife and lost her suddenly to an aneurysm. Turn Around Bright Eyes starts in that lost post-grief space and covers how music, specifically karaoke, held him together. It reads like a cross between memoir and music reporting (which is fun, because he writes for Rolling Stone). This is a very sweet and tender story, his writing about this tall, skinny white dude belting out “Crazy in Love” or “Church of the Poison Mind” in a seedy karaoke joint and telling us he really can’t sing for realz but there is just something transformative about karaoke that makes him get up and do it. (He gets a lot of props from me because I have only done karaoke a few times and, as a singer, sucked balls at it and so never wanted to try it again.) Also, I’d love to meet his second wife because she sounds awesome. There are so many fantastic authors and great books out there that sometimes it’s hard to know where to begin. 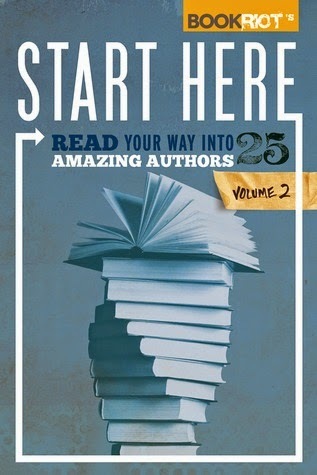 Start Here solves that problem; it tells you how to read your way into 25 amazing authors from a wide range of genres–from classics to contemporary fiction to comics. Start Here Vol. 2 helps by showing you how to read your way into 25 amazing authors from a wide range of genres–from classics to contemporary fiction to comics. Each chapter presents an author, explains why you might want to try them, and lays out a 3- or 4-book reading sequence designed to help you experience fully what they have to offer. It’s a fun, accessible, informative way to enrich your reading life. Each chapter is written with expertise and passion to help you get started reading authors you’ve always wanted to try. There isn’t much I can say in the way of introduction but if you’re looking for more ways to add books to your TBR list and want to find authors that are new-to-you, you can’t go wrong with Book Riot’s second offering in their Start Here series. I definitely appreciate the Douglas Coupland chapter, since that’s an author that I haven’t ever read and wasn’t sure where to start. I love how each contributor has his or her own way of arranging their chapters. Dear FTC: I was a backer for the Kickstarter (thanks Rebecca) so I received this copy of the ebook for free. 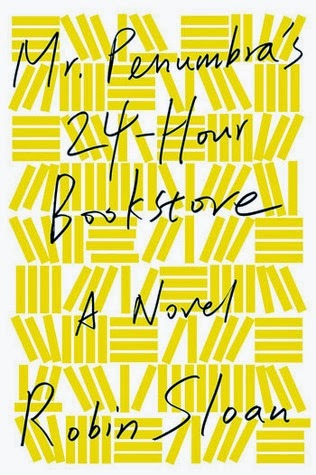 I got to meet Robin Sloane when he was on tour for the paperback release of Mr. Penumbra’s 24-Hour Bookstore (I had a hardcover that was languishing the TBR stack). What better than to jump-start a read? I loved the premise but I was expecting more of a thriller at times. Every so often I would get a hint great building tension in a scene but then the resolution would back off quite a bit. And I think the end does fizzle a bit because of this since there isn’t anything truly nefarious going on. The plot did keep moving, though, so this was a good read. It’s such a geek novel – data visualization, code breaking, programming, etc. sounds of Led Zeppelin and Marvin Gaye. And of jackhammers: A futuristic pyramid of a skyscraper is rising a few blocks from City Lights bookstore and an unprecedented subway tunnel is being built under the bay. Meanwhile, south of the city, orchards are quickly giving way to a brand-new industry built on silicon. As a bonus, those of us who went to Robin’s signing got a little paperback novella titled “Ajax Penumbra 1969”. It’s a fun prequel but it should only be read after reading the actual novel or else you’ll spoil some things for later (just be prepared for an odd perspective switch from 3rd to 2nd and back in the middle). Who likes beautifully illustrated books? I know I do! 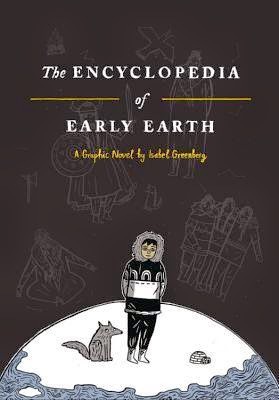 I took one look at Isabel Greenberg’s The Encyclopedia of Early Earth and I just knew that I had to have it. A fabulous collection of “myths” that feel derived from Native American legends that center on a Nord man and South Pole woman who cannot touch because of their opposing magnetic fields. One would think that might be cause for a break-up, but no. The artwork is so enjoyable, largely through a limited color palette, and I loved the typeface created for the writing/dialogue. Holidays are winding down. The store is filthy from winter mess, covered with bargain bins and half-off signs, and full of customers. The cutest customers ever were two teen sisters (maybe twins – at most only 1 year apart) who share a room because they converted the other bedroom into a library. A library. The whole room is filled with books. They were in spending Christmas book-buying money (and think about the buying power when there are two of you and you can pool your money since you like similar things) and having a hoot while doing it. So cool. I had a customer looking for I am Malala. To my surprise (and delight), it turned out that we had sold out on Christmas Eve and were waiting for more stock. I may have done the “yes!” thing a little too enthusiastically. Customer: Why are you so happy that you’re out of Malala’s book? Me (oops, that probably didn’t look so good): Oh, sorry, not happy that we’re out but happy that it sold out. We sold out of all the conservative-white-dude books earlier this month and got a ton of restock. But I’ve been trying to get people to buy more Malala for weeks. Nice to see that it finally kicked in. And we high-fived. And she ordered it (it’ll probably come Monday anyway since we had a boatload on order). The Fifty Shades of Gray Party Game and expansion packs went in the post-Christmas bargain sale. In 24 hours we hadn’t sold any copies of the actual game but all the expansion packs sold. Uh….. I spent the first twenty minutes of my shift yesterday looking for books on Norse language and history for a customer (male, college-age-ish). We didn’t have any language books on Old Norse since those are academic textbooks (he didn’t want Norwegian or Swedish language-learning books) but I did eventually find a few books about the history of the Vikings, one of the Eddas, and Bengtsson’s The Long Ships (a novel, yes, but well-researched). I handed the books to the customer…who then took pictures of the covers and bar codes and handed them back. Me (pretty well stunned, because no one has ever done that in front of me): Do you want me to hold these for you? Customer: No, I’m just going to buy them on Amazon. Then he walked out the front door. And that, ladies and gentlemen, is how you induce a murderous rage in a bookseller. Laura van den Berg’s gorgeous new book, The Isle of Youth, explores the lives of women mired in secrecy and deception. From a newlywed caught in an inscrutable marriage, to private eyes working a baffling case in South Florida, to a teenager who assists her magician mother and steals from the audience, the characters in these bewitching stories are at once vulnerable and dangerous, bighearted and ruthless, and they will do what it takes to survive. Each tale is spun with elegant urgency, and the reader grows attached to the marginalized young women in these stories—women grappling with the choices they’ve made and searching for the clues to unlock their inner worlds. This is the work of a fearless writer whose stories feel both magical and mystical, earning her the title of “sorceress” from her readers. Be prepared to fall under her spell. I don’t know why Laura van den Berg hasn’t shown up on my radar before except for the rather glaring reason that I had stopped reading short story collections (one of her previous collections was a Discover pick – oops). 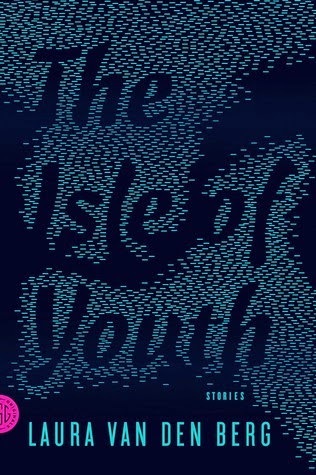 But she just started appearing everywhere I looked on the literary web so I really didn’t have an excuse not to pick up a copy of The Isle of Youth. A lovely, haunting collection comprised largely of female protagonists who feel largely out of sync or out of place in their current role. A newlywed whose plane crashes on the way to her honeymoon must deal with resurfaced doubts about marriage. A young woman must care for her little brother while on the run from the cops – and her crazy, prepper father. Another tries to piece together some part of her brother’s life in Antarctica after he dies and yet another goes AWOL with French acrobats as her marriage implodes. Van den Berg has such precise writing; perhaps not as scalpel-like as Alice Munro but very pared down. ‘Tis the Season: Do you know all the capitals in the world? We are now into the hellish part of the holiday shopping season, the part where people have the most oddball requests and we have zero time in which to fulfill them before Christmas Day. Dad (with two teenage girls in tow): Do you have books about Portugal? Me (Reminder: we are in Iowa): Well….I’m pretty sure we have some travel guides right now. One of the girls (with a voice to match all her A&F gear): We want a book about Portugal. Dad: Like about where the country came from. We have a themed Christmas and they picked Portugal this year. Me (WTF, I bet you knew about this more than three days before Christmas, and who is “they” because I want to “have a discussion” with them): Well, let’s head over to the history section and see what we have. Dad: You have a history section? Me: Here you go. This is about Lisbon, the capital of Portugal. Dad: Wow, do you know all the capitals in the world? Me: Probably. At least most of them. Other teenage girl: Do you know where we can buy things made in Portugal? We are the whitest white people ever. Oy. The “Where are your classics?” question is a late-breaker this year. I hadn’t got that one until yesterday when I had three of them. Customer: Where are your classics? Me: Well, we don’t have a separate section. Some titles are on a display, but most are in their specific subject arranged by author. Is there a specific title or type of book you’re looking for? Customer: *blink blink blink* A classic. “Classic” really isn’t a genre. If you talk to a Classics major, then you get the Greek and Roman Classics which encompass philosophy, history, and drama. In more general terms, a classic work of literature is basically something approaching at least 100 years of age and is still read (more or less – this is one of those “definitions” that’s become very elastic) and those span every conceivable genre and subject. Plain old fiction, romance, mystery, science fiction and fantasy, mythology, western, drama, poetry, essays, history, philosophy, cooking, sporting, economics, travel, religion, and on and on and on. All classics are not alike. If you want something sort of crazypants and are a Lovecraft (who, depending on definition, is approaching classic author status) fan, then you’re probably not going to be over the moon with Dickens. You’d be happier with Kafka or Stevenson. If you are easily offended, then don’t read DH Lawrence. If you’re looking for something short then Eliot or Milton are not good choices. So when the bookseller asks if you are looking for a particular book or subject that might happen to be a classic piece of writing don’t just say “classic.” We do actually want to help you find something you like (or find something the recipient of your gift will like). Put some thought into your answers to our questions. “Anything” doesn’t count as an answer. Otherwise, we’ll leave you alone in the corner to cry over the thickness of Don Quixote and War and Peace (and be assured, we have found the thickest copies we have).